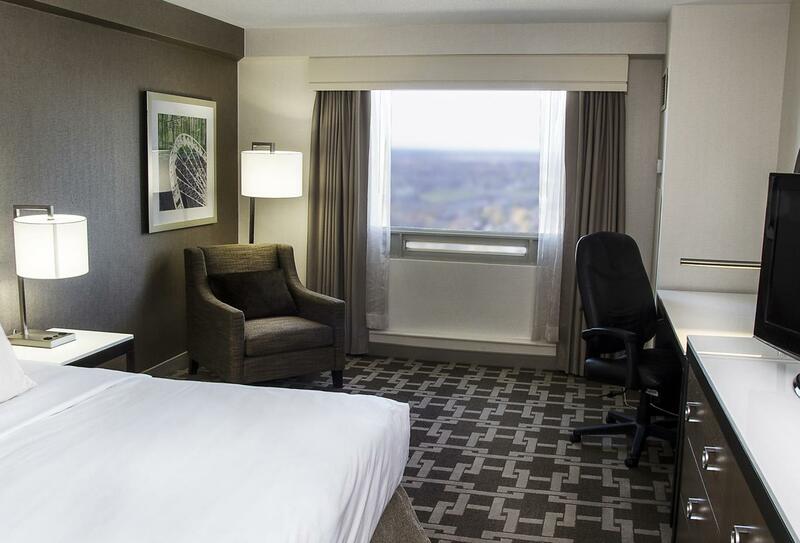 Hilton Niagara Falls is a modern and elegant hotel 5 minutes by foot from Niagara Falls. Rooms offer amazing views of this spectacle and one of the stand-out places to relax against this breath-taking sight is at The Watermark Restaurant on the 33rd floor with multi-level seating and floor-to-ceiling windows. Authentic Italian fare is served at Pranzo Italian Grill including the most delicious hand-crafted pizzas courtesy of a traditional brick oven. There’s seasonal nightly entertainment enveloped by panoramic views of the Falls in Myst Lounge on the 34th floor or why not enjoy a traditionally grilled steak at Brasa Brazilian Steakhouse? The Fallsview Casino is a highlight here and is linked by an enclosed walkway while a delightful indoor pool, waterslide, modern fitness centre, sauna and whirlpool round out the leisure options. A simple European style room with a plush king size bed. 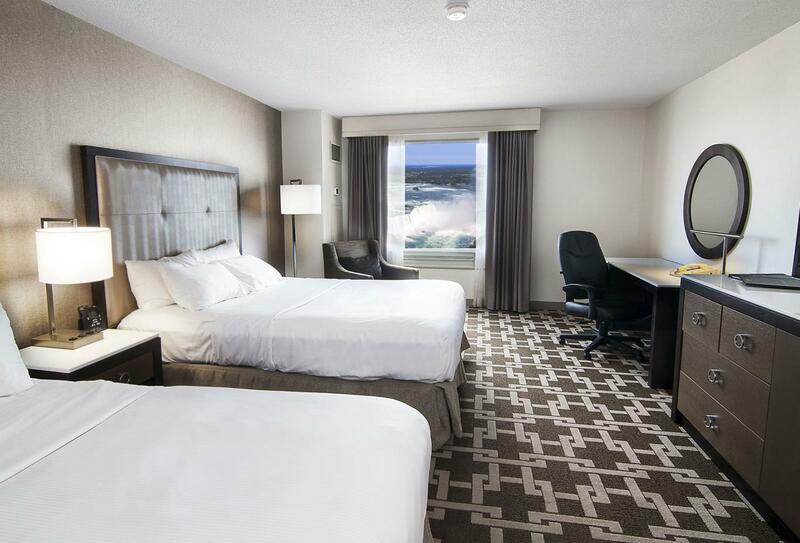 Inviting and cosy room with two queen size beds and a wonderful view of the American Falls. Other features include an armchair, ottoman desk and a generous bathroom with a soothing tub. This Brazilian steakhouse or Churrascaria (pronounced shu-has-caria) continues the age-old tradition of roasting cuts of beef, chicken, lamb and pork over open fires which are then served to you by traditionally dressed Gauchos. There’s also a buffet of freshly grilled vegetables and traditional Brazilian sides. Open every day 17.00-22.00 (until 23.00 on Friday and Saturday). A traditionally European setting serving a breakfast buffet of the freshest ingredients from hot and cold stations alongside seasonal fruit and freshly baked pastries. Open every day 06.30-10.30. This is the place to grab a coffee from Starbucks alongside other options such as frozen yogurts, muffins and slices of pizza. Open every day 07.00-23.00 (until 01.00 on Friday and Saturday). Enjoy amazing panoramic views of Niagara Falls from the 34th floor in this rooftop lounge serving cocktails and seasonal live entertainment. Open every day 17.00-23.00 (until 01.00 on Friday and Saturday). Enjoy an authentic mix of traditional Italian fare and signature dishes alongside perfectly cooked hand-crafted pizza from a brick oven. Open daily for lunch and dinner 12.00-22.00 (until 23.00 on Friday and Saturday). 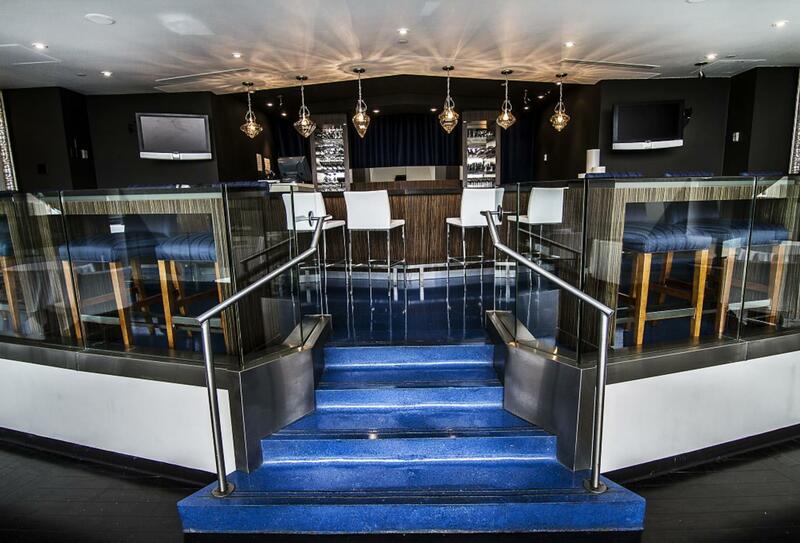 Be in the centre of the action at this street level lounge in the heart of Niagara’s entertainment district. Enjoy nightly entertainment and a full lounge menu. 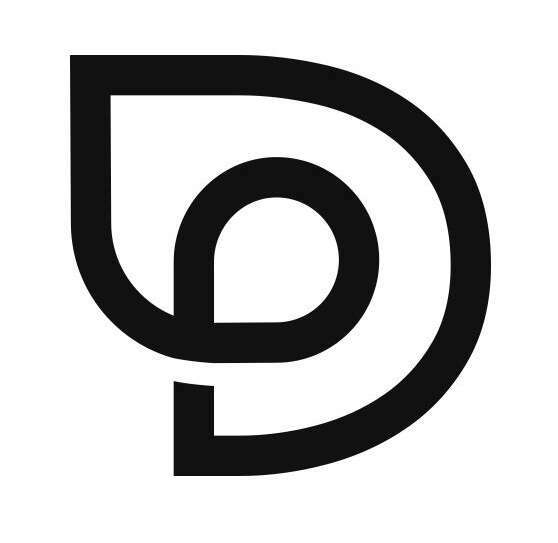 Open daily 12.00-0.00 (until 01.00 on Friday and Saturday). Enjoy continental cuisine at this 33rd floor rooftop restaurant with multi-level seating and spectacular views of the Falls from floor-to-ceiling windows. Open daily 17.00-22.00 (07.00-22.00 on Friday and Saturday). 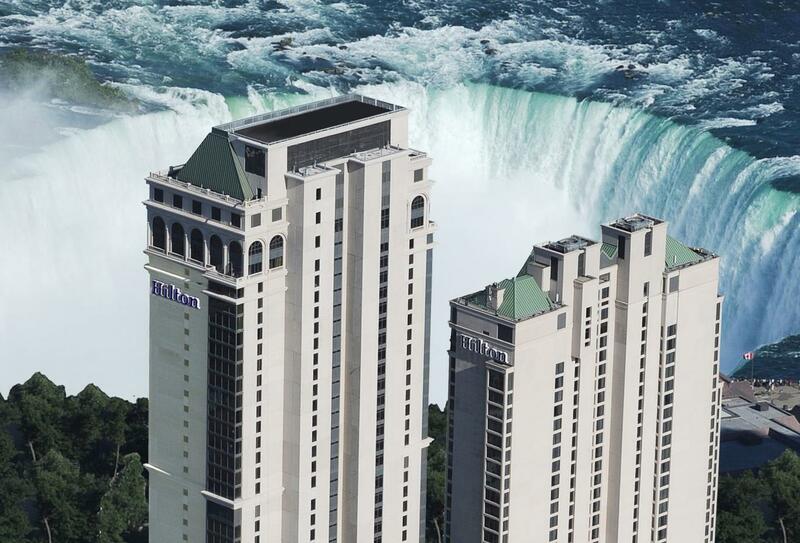 Hilton Niagara Falls is a 5-minute walk to the Falls and connected to Fallsview Casino by an enclosed walkway. It’s also close to dining and shopping venues. Niagara Falls International Airport is 11km from the centre of Niagara Falls, Canada.